Our cottage is located at the water's edge in a private park setting on the eastern boundary of Dreamland Resort. 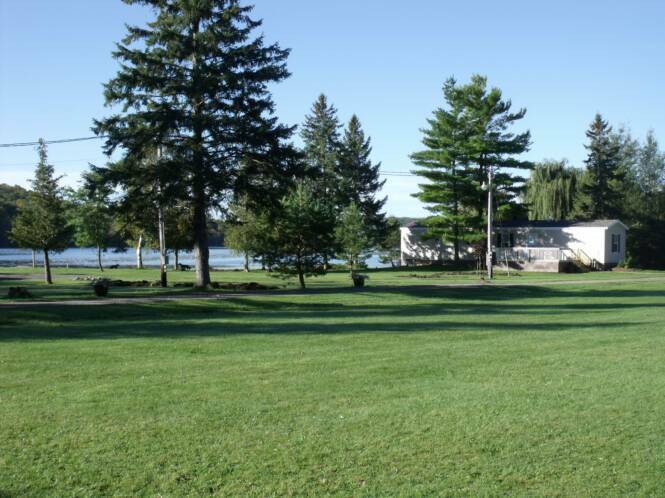 The resort is located at the east end of Rice Lake on the Trent River system, with lock-free water access all the way to Peterborough. This new 3-bedroom, 4-season, 900 square-foot Fairmont home is fully furnished. Summer air conditioning and winter heating are included. All appliances, cookware, and dinnerware are provided. All of the facilities of Dreamland Resort are available to cottage renters during the summer resort season. The home is available from the May long weekend thru October 14th for weekly, monthly, or longer periods. Check-in time is 2pm on Fridays....Check-out time is 11am on Fridays. Contact us for availability and prices. A password protected web page contains the latest detailed description, rental procedures, photos and rates. Please complete this email request or call us for the current password. After the password has been issued, follow this link to the 'Cottage Rental Features' page. Rent a 900 square foot 4-season cottage in a park setting beside Dreamland Resort. This new fully equipped lakeside cottage sleeps six in 3 bedrooms. All appliances, cookware, dinnerware, bedding, etc. included. A private dock is also included. Just bring clothes, food, and your boat. All Dreamland Resort facilities are available to cottage renters during the summer camping season. Available between May long weekend and October 14th for weekly, monthly, or longer rentals.